Welcome to my tour stop for The Banished Craft by E.D.E. Bell! The tour runs August 18 – September 1 with reviews, interviews, guest posts, excerpts and giveaways. 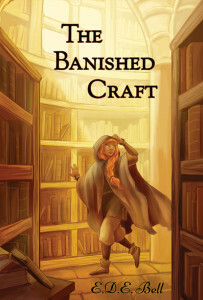 The Banished Craft is a fantasy novel and is written for adults but is appropriate for mature young adult readers. This is the first book of the Shkode series and releases on September 1, 2015. The Banished Craft is a genre-bending fantasy saga that follows the adventures of Cor, a woman caught in a dying world that does not accept her, and Atesh, a dragon scientist who’s been asked to violate his own ethics or put the lives of his family at risk. Follow their trials as they deal with a shattered world, mired in political upheaval, while they try to rediscover a lost magic. The Banished Craft begins the Shkode trilogy: a quirky and modern take on dragons and wizards, exploring themes of identity, prejudice, violence, compassion, and the ways we are all connected. Website | Facebook | Twitter @edebellauthor | Pinterest | Instagram | WattpadBell will be releasing her first Wattpad story on 1 Sept to coincide with the release of The Banished Craft. The Banished Craft is direct, complex, and a little bit strange, which is already a pretty good look behind the scenes at its author. I’m really proud of this opening novel to the Shkode genre-bending epic fantasy trilogy. If The Banished Craft is about one thing, it’s about passion: the passion of a four-dimensional creature to assist in the survival of a world she inadvertently set on a course to destruction, the passion of a repressed woman to discover the mystery of her parents’ death and how it relates, and the passion of a pair of dragon soulmates to save the world so that their whelp can grow up. It’s an interesting road that brought me to the point of writing this book, but I’m glad that it’s the one I followed. I went to college for electrical engineering in Michigan, came upon a job in the defense industry, moved to Virginia, married a cool guy, had three cool kids, and ended up working in Ohio at a military base where, without getting into it, I experienced some very frustrating situations. This drove me to realize one of my own true passions: fantasy fiction. One day I picked up a notebook and a pen, and I started to write. Don’t worry, the pen and paper didn’t last long. Here, with my slightly old MacBook Pro, is my usual workspace—at least if my husband gets the kids out of the house or they are out playing. 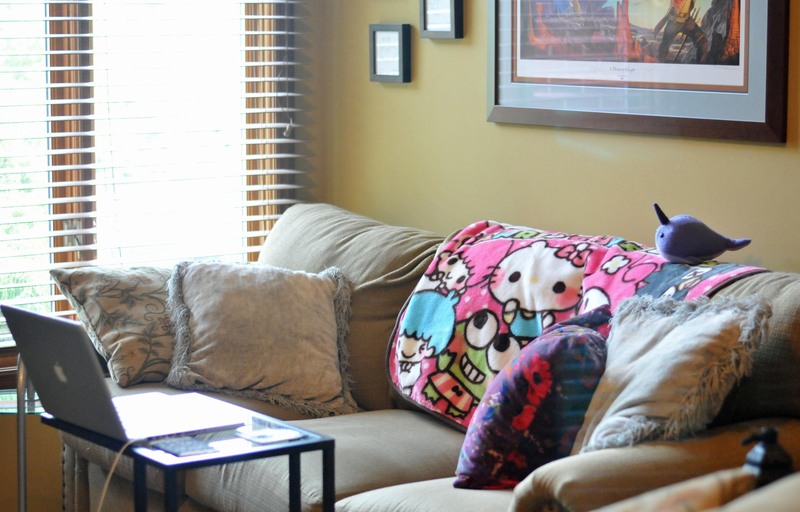 It’s just a couch, a couple of sidetables, and a coaster for a nice cashew latte (ok, sometimes a martini). I can look outside, which I especially love if it’s raining or snowing. And when it’s not, I can watch little birds and animals outside of the window, or sometimes the neighbor mowing the lawn. I don’t watch him, but he’s there. Because of my full-time job as a technical advisor and manager, and the aforementioned three kids (©), my designated writing time is whenever I can get time to write. This means I write in the evening and weekends: in between music lessons, school events, and family visits. Sometimes I am fortunate, and I get an hour or two alone, where I can write uninterrupted—except by my cats, who do not care about the sanctity of writing time. But most of the time there are playing children, phone calls, and other “quick” yet entirely distracting interruptions. With a family to support, I do what I can, and a writing career takes time to build. But if you like what I have to offer and are willing to join me on this journey, I’m willing to put the work in. Whatever it takes. 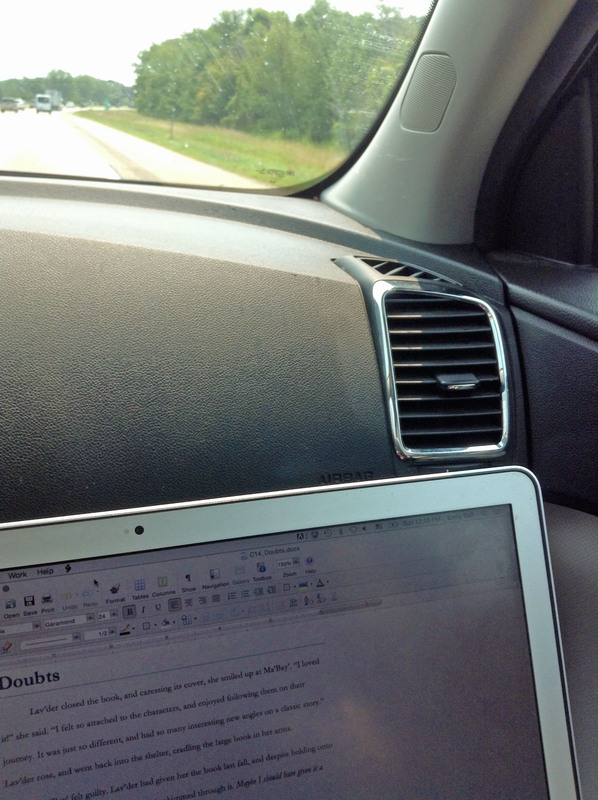 This is my other office, when we are visiting family and my husband is willing to drive so I can write. This picture was taken while writing this blog. There is always distracting music on the radio, kids bickering in the back, and my screen bouncing in ways my eyes and stomach don’t so much enjoy. So what is all this madness? It’s my passion to write and to explore, because speculative fiction is all about exploration of the mind as well as of the realm. Cor is illustrated on the cover, determined to find her book, but behind her is me, determined to write mine. And I hope you join me for the adventure. Prizing is provided by the publisher and hosts are not responsible in any way. I can’t even imagine trying to write a book while holding a full time job and caring for family. In fact a couple years ago I had a book in my head needing to be wrote but I just couldn’t do it with my distractions. I quickly discovered I’m not cut out for writing at this time (at least more than reviews and blog posts). But I have the utmost respect for those that can manage it!